Iowa’s Offense was about as bad as it’s been all season. Let me re-phrase that, given the opponent, the offense was the worst it’s been all season. 10 points in regulation. Really? That’s inexcusable – especially coming out of the bye week where the talk from coaches and players was about improving the rush. The individual grades below are higher but the collective effort deserved at least this, and maybe I’m being too generous. Nate Stanley continues to impress – and grow – in his starting role. Two more TD passes add to his season total. There was a great deal of adversity in this game, and he persevered. That is a good thing for this team going forward. Hard to give a grade higher than this when you only rush for 89 yards. Akrum Wadley tried and did finish with 90 yards. It’s not his fault the play-calling was so bad, trying to keep running him up the middle instead of utilizing his talent in space. Stanley completed passes to eight different receivers but nothing special stands out except his 61 yard completion in the middle to Matt VandeBerg (that was a thing of beauty). Noah Fant dropping the game-ending pass in OT was a killer – but the Hawks shouldn’t have had to be in that position to begin with. The Line only surrendered two sacks but struggled to block inside zone and for the most part outside as well. Iowa only netted 89 rushing yards and the fault for that primarily lies with the curious and stubborn play-calling of Brian Ferentz and the lousy job of run-blocking by the line. Not to mention the killer penalty on fourth-and-inches late in regulation when Kirk was going for the 1D and the TC when the right side of the line was called for a false start. 3 sacks and decent pressure – for the most part helping to contain both NU QB Clayton Thorson and RB Justin Jackson. Ben Niemann and Kevin Ward turned in solid performances with Jewell out of action – except Jackson’s big play prior to NU’s OT TD (23 yard catch and run to the Iowa one yard line). 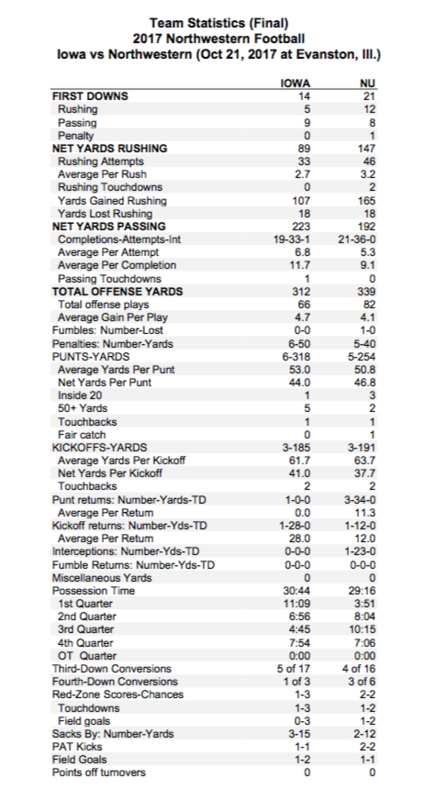 A solid game all-around – especially considering NU’s havoc-inducing passing routes. Decent game, especially considering field and wind conditions. PK Miguel Recinos missed his first field goal attempt into a difficult wind but came back to hit the game-tying FG near the end of regulation. His kickoffs were again solid all day long. Very solid game by new starter Ryan Gersonde – who was generally long and high both into and with the wind – he averaged 52.6 yards on five punts. Another mistake by Joshua Jackson deep in Iowa territory resulted in a 80 yard punt by NU’s Hunter Niswander. Yes, the wind was a complicating factor, but that was a critical play. He needs to improve or Iowa needs to try someone else in that role. Kelly-Martin continues to look solid although he only had one opportunity in this game (28 yard return). Kirk drops to just 2-8 overall in road games coming off bye weeks. The Offense was flat-out horrible after what supposedly was an emphasis on improving the run game. The bye week is supposed to be helpful to teams and this year it came right in the middle of the season (which should be ideal). Just seven points away from “F”. I like what he’s been doing most of the season but this was a terrible display of offense and the play-calling was beyond curious – it was stubborn and highly questionable. I thought Greg Davis had snuck back into the press box and/or “Old” Kirk had dictated the play-book for this game. Things are going in the wrong direction if this was any example. His bend-but-don’t-break defense hardly bent and did about all you could ask of it under the circumstances. This is split three ways: LB Bo Bower (11) and LB Kevin Ward (4) who both had career-high tackles and DT Nathan Bazata who had a career-high 1.5 sacks. There’s only one choice – if for no other reason than process of elimination. But Defensive Coordinator Phil Parker earns this for constructing the Defense that held NU to just 10 points in regulation. Iowa coulda, shoulda, oughta won if the Offense even made more than a token appearance. Iowa – Northwestern Week Content is at HawkeyesMic.com/Football.